Sometimes I get ideas when I walk. And I’m not talking about when I walk on the treadmill, or go around the lake by my house for exercise. Those walks include Netflix and podcasts. (I’ll let you figure out what goes with what.) I’m talking about the walking I try to do every morning while I wait for the coffee to finish brewing. I walk from my kitchen to my dining room to my living room and back to my kitchen. Then repeat. The loop takes about 25 steps. Times that by a larger number and you’ll get 1,000 steps, which is what I shoot for as a minimum requirement before I tackle the day’s first internet tasks. Sure, if anyone looked in my front window they’d wonder what the hell I was doing, but it all adds up to a little more movement in my day. While walking this morning I got an idea for this blog post. I keep my December Daily album out on the dining room scrap room table all during the month of December. I like to see the progress and to flip through the pages. As I walk, I see it on every lap and it reminded me of a conversation I had with Aidan over the weekend. She was home for an overnight and I was flipping through a photo album that contains all the shots of me and Dan’s first year together, including our first Christmas. While there are a few things I do remember (shopping at Dayton’s with my employee discount to get brand new ornaments and then coming home from work one day to find the tree had toppled, breaking half of those ornaments), there are so many things I just do not remember. For example, where’d we get the tree? It was the first Christmas of my life having a real tree. 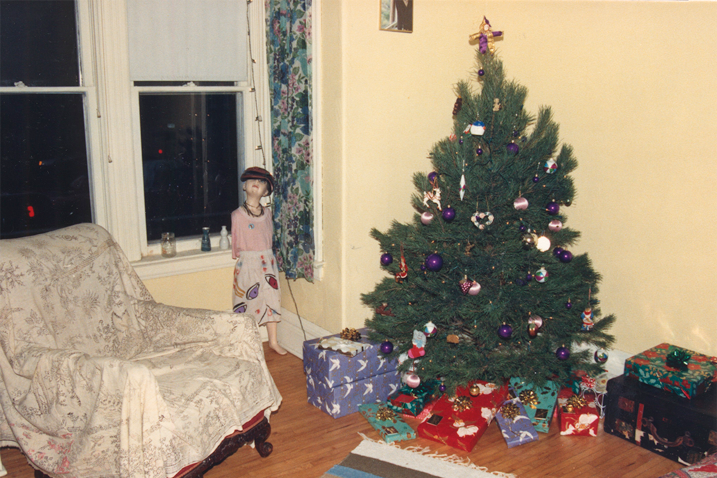 I’d grown up with a much loved artificial version, so the experience of shopping for a tree was completely novel. And I have no memory of it whatsoever. What gifts did we give to each other? What did we do on Christmas Eve? What was is like to spend my first Christmas away from my family? How did that even feel? I realize some of us are gifted with a sharper memory than others, but as I near 50, there are a lot of things in my life I don’t remember. How I would love to have little Christmas albums from Aidan’s first one. Or Cole’s. Or me and Dan’s. And you know what? I’m fully certain that if I get to be here on this planet for another 5, 10 or 15 years or more, I will look back on this year’s album with much gratitude for having done it. This is less of a lament than it is a celebration of the power of a little holiday scrapbook and scrapbooking in general. I’ve known Ali for some 12 years now, and it’s crazy that just now I’m really getting the value of a December Daily album. So thanks, friend. Keep saving those little stories, in December and beyond. You will thank you someday. Laura, I hear you. But I tell you what: YOU will find the value. 🙂 And that is pretty cool. So true – this is why I like to scrapbook. Just to remember those little snippits in life that get lost in the big picture. Thanks for sharing. So true about the frailty of memory. I’m (finally) doing an album of a vacation we took in 2011 and I remember. . .NOTHING. Thank god I kept a journal so there will be some text and not just pictures. I think we all wonder whether those who come after us will care about our carefully crafted scrapbooks. But, as you point out, we’re really doing them for ourselves. After that, que sera sera. I don’t have grandchildren, but dearly loved great-nephews and great-niece. I was thinking recently that I have many vivid memories of the older great-nephew’s toddlerhood and I don’t have as many memories of the others. There are a number of reasons for that – a 2 hour distance being a large part of it, but also, although I have taken a ton of pictures of all of them, about the time the 3rd, 4th and 5th ones came along, I had stopped keeping up with printing pictures and making scrapbooks. Part of my vivid memories from earlier on are looking at the pictures I printed and reliving those stories. It’s not too late – I’ll print those pictures and make those scrapbooks but your thoughts today really resonated with me. Nice tribute to your friend and every word is absolutely true. Some years I figure I’m just doing it for me. And you know what? That’s okay. Other years, one of my girls or hubby will sit down and crack an album open and that’s when I find all the time and planning to be worth it. Totally and completely worth it. And I’ll take those few moments and get on with making another album. Love it, Cathy. Love it. I have been scrapping for 15ish years, since my oldest was a baby. I have one Christmas scrapbook with one 2-page layout for each year. Except one. 16 of 17 Christmases with my husband are represented. It’s not everyday. It’s not every story. But I love it. Thanks for the reminder! This year I didn’t plan to do a DD because I did one last year (completed it and made it into a book – for the first time!). But I had an idea that I’d do a “31 days of thankful” for the month of December instead of November, just because there are so many little things I’m thankful for this month and why not capture them? So it’s turning into a kind of DD, but with a twist. I’m enjoying having the focus be on gratitude. Find myself thinking multiple times a day of what I’m thankful for *right now*. It’s a nice addition to the season this year. In a similar vein a few years ago I took pictures of various Christmas ornaments and decorations that I use every year and wrote a little about when-where-why. I keep these in a small 3 ring album that now joins the traditionals and can be added to with photos of new treasures. Then something woke you, didn’t it? Was it a dream? What was it? What WAS it? You just put the BIGGEST smirk on my face. Merry Christmas indeed. Thank you, Barney. Thank you. I’ve mostly done December Daily for a few years. Mostly meaning that I start out strong and tend to crap out at the end. But this year I’m caring for my parents whose minds and health are failing, and I don’t want to remember. It’s been the hardest year of my life and is going out with a bang, and not in a good way. Maybe someday I’ll want to remember this December, but right now I don’t want to. I don’t want to remember today or yesterday, or the day before. I can’t bring myself to document it because it’s yucky, and hard, and heart-breaking. And all the things that are December to me – the baking, and cards, and decorations, and friends – are taking a back seat so I can manage doctor’s appointments and rehab and assisted living and memory care. And I’m heart-broken because of what we’re going through and because I don’t want to document it. Do I really want a December Daily album where every page has a picture of the assisted living facility I visited that day? I can’t decide. Britiney, I’m sorry for your sadness and what you are going through. Life is hard. It has pain. It’s not all wonder and magic. In fact, I’m not a believer in that sort of thing. I believe in reality, or at least I’m trying to. I love that quote Cathy. Thank you. It’s so so good. Britiney, your post is so touching…first my heart aches for you, and I understand to some degree what you are going through. I bailed on my scrapbook for 2014 early in the year for whatever reasons and as it wound down I KNEW 2015 was going to be really hard based on how the year was ending. (and I was right) I buckled down and did a December Daily-ish in 2014 JUST so I could find some perspective on it all and get in the habit of being present again. I promised myself to only do what I could do and to not put any restrictions or demands on what I shared, wrote, photographed. It helped me get that perspective and helped me practice being able to say ‘this just sucked’, which came in handy as the year unfolded pretty much as I had predicted it would. I pulled that album out the other day and I am so very grateful I did it and also committed to keeping up 2015. My 2015 album is probably one of the most minimalist albums I’ve ever done, at times just thrown together, at times so very emotional that I don’t know if I can read the journaling yet…. (in fact, I haven’t printed the digital pages in over 6 months!) but also showed me that just because some things were pretty ugly and crappy, there was so much good that went on. Like Cathy, I forget so much that if it weren’t for this commitment I’ve made, I would lose so much in the vast cavern that is my brain. Right now things seem tough for you and you likely don’t have the mental energy to do it. Free yourself of it then in the traditional sense that it is being done..and perhaps make one page that represents this space in time. Allow yourself to be genuine as you were in your post….it’s ok to say things really stink right now and here’s why. What you wrote above is a great start. I guess my rambling point is, this is life. And sometimes life is hard. The story of the journey through that is worth telling just like the fun stuff…and perhaps even more important because the crap we go through that tears us down has a way of making us stronger. Hang in there. Cathy – you TOTALLY just inspired me for day 14!! I’ve been pondering this morning what my story for today would be, but now I know! It’ll be the story of our first Christmas as a married couple! I have never really documented the details (it was 13 years ago), but I still remember many of them. In fact, just last week the tacky light up star we chose that first year died. My kids were stoked about the idea of a new star but both my husband and I were a little bummed. Because it’s the end of an era, you know? I need to find a pic of our first tree and tell this story, and there is no day like today right?? I just can’t manage doing a daily, but I do try to jot down notes about some of those little things to put into my layouts. I’m just a bit older than you, and I look through old college albums and I think, who are some of these people? I don’t remember their names! What were we doing? Why are we laughing? I own a store and the comment Laura made is something I hear a lot “will my kids (or anyone) care when I’m gone”. My answer is the same, how does it make you feel when you are scrapbooking, documenting, creating? If the answer is good, happy, fulfilled – then it doesn’t matter what happens when your gone. Going on year 5 of Dec daily:) and year 8 of owning the store- still love what I do and who I meet each day! Great blog post Cathy. I have to ask though, what is the mannequin in the corner? Do you have a spare room where you can stick the mannequin in front of a window facing out? (Spoooooky… and pretty creepy too… but wouldn’t it be fun?) Or does your attic have a window? Having gone to a funeral yesterday and been privileged to listen to some memoirs written by her husband, it really made me appreciate again how important it is for us and our wider family to document our lives. Uncle Keith died 30 years ago, in 1985, and Auntie Emily was 90 when she died, but at her thanks giving service we got to hear the story of how they first met, from the point of view of her husband. It was incredible (helped by the fact that he was obviously a fabulous writer!) and it totally came from the heart. Emily was my Dad’s aunt, and I have only ever known her as a “little old lady” – she was only 4’11”! but in this memory she was 19 and pretty and spritely, and it was wonderful. So never underestimate the worthwhile nature of your documenting! Those scrapbooks become more precious with time. 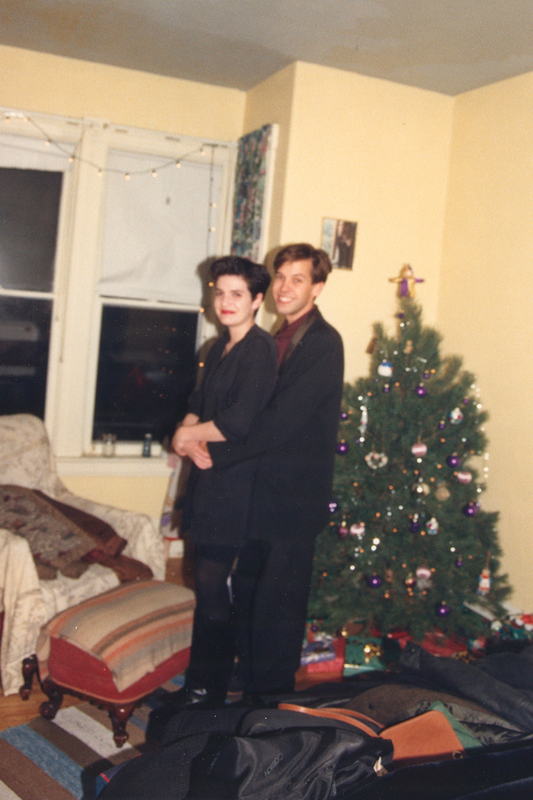 I also can’t remember what happened on our first married Christmas. It was 35 years ago. But I remember being very happy. You’re so awesome. Love this and DD! Please take pictures of the mannequin in the attic window!! You just shifted my paradigm. Thanks for that. Even those of us without kids find these cute little albums, and PL and my regular pages go to have. And they are changing from event and information based to feelings based. This year, I’m grateful, because my Dad is no longer with us and I’m really glad I have that photo of him wearing the fake curly sticker mustache that was all the rage 2 years ago.